All PLEASANT VIEW ESTATES homes currently listed for sale in Peoria as of 04/20/2019 are shown below. You can change the search criteria at any time by pressing the 'Change Search' button below. "INSTANT EQUITY!!! Priced below recent appraisal, this gorgeous custom estate is a deal! Fully remodeled 5,716 SF main home offers 4 bedrooms + office w/ separate exit - could be used for home based business or 5th bedroom, 3.5 bathrooms, library & game room. 270 SF Guest House with kitchenette, laundry & bathroom w/ handicap accessible walk in shower. 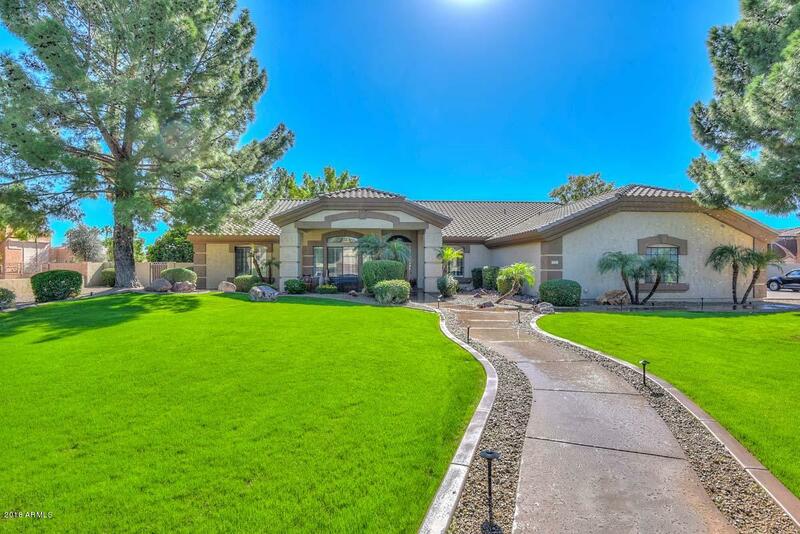 Resort style backyard offers an oversized diving pool w/ slide, a ramada with built in BBQ & fireplace, 2 covered patios, a grassy play area, ci"
"Located in Pleasant View Estates this lovely custom home has 5 bedrooms and 5 baths which includes a separate guest casita! Beautiful entrance with winding sidewalk surrounded by plush landscaping. Step into the home via the custom front door and you will find a living room and a dining room on either side of the entrance opening to the great room and living areas of the home. You will notice the neutral flooring, plantation shutters showcasing the windows, arched doorways, tall ceilings and soo"